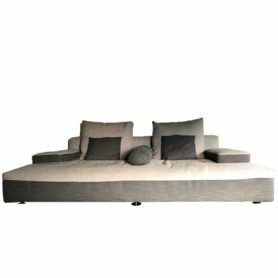 Glow-in by Désirée is a comfortable, enveloping and oversize sofa. With neutral colors and soft lines, it is perfect for decorating your living area. It is an island where your can sit comfortably and in relax. It adapts to any environment but is ideal for furnishing with a modern but also ethnic style. Glow-in is made by Désirée, a company that produces a collection of furniture: armchairs, sofas, beds and accessories.